With just three ingredients and less than 10 minutes of your time, you can make this delicious 3 Ingredient Nutella Fudge. If you love Nutella and chocolate, this is the sweet treat for you. Gather ingredients and line an 8×8 pan with foil and spray foil with nonstick cooking spray. Place chocolate chips, Nutella, and creamer in microwave-safe bowl. Melt in 30-second intervals until smooth. Add mixture to pan and spread out evenly. Sprinkle chopped hazeluts evenly over fudge. Refrigerate for at least an hour to set fudge. Once set, cut into small squares and enjoy! Store Nutella fudge in an airtight container in the refrigerator. 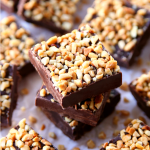 This fudge can also be prepared using a double boiler on your stovetop.